As mentioned in my previous Pinspiration Posts (The Grinch Door and Reindeer Cupboard), I had my students respond to on our discussion board to the question “What would your dream classroom be?” One of the top ideas was to decorate the classroom, so I enlisted the help of my stepsister and we came up with a variety of fun Pinterest ideas to implement. 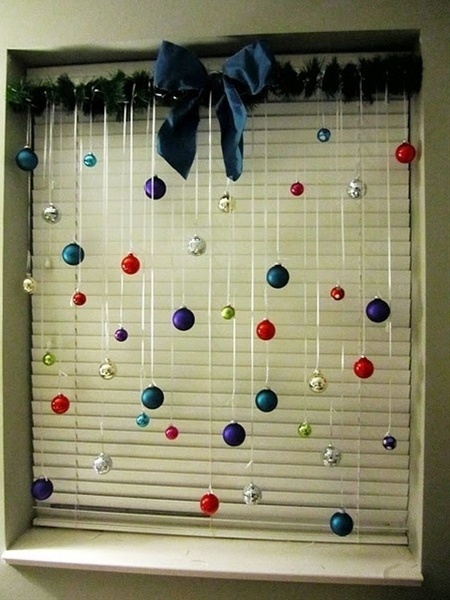 She sent me a pin with ornaments hung in front of a window, which would work perfectly in my classroom (see Pinspiration photo, left). She and I got together one weekend and made our shopping list. My dad had some extra garland he wasn’t going to use, so we decided to make it part of our project. Then, we ran to Target to pick up the ornament balls, ribbon, and command hooks we would need for the rest of our project. It worked out well because Target had medium and small ornament balls in the $1 Spot which had all the colors we wanted! Gather Materials – We purchased our materials and made our way back to the house to prepare the ornament balls for hanging. Tie the ribbon to the ornament balls. Hang the command hooks – We hung 3 command hooks per window at the top of the window. Hang the garland – My homeroom students helped me hang the garland from the hooks. Tie the ornaments to the garland – Then, we hung ornaments of different sizes, colors, and lengths to the garland. The students love the ornaments and were excited to help put them up. They were nearly “fighting” over who got to help, which for 8th grade students is kind of impressive as I’m normally lucky if I can get them to do anything without bribing them. Once again they are taking ownership of their classroom and how they want it to look and feel.